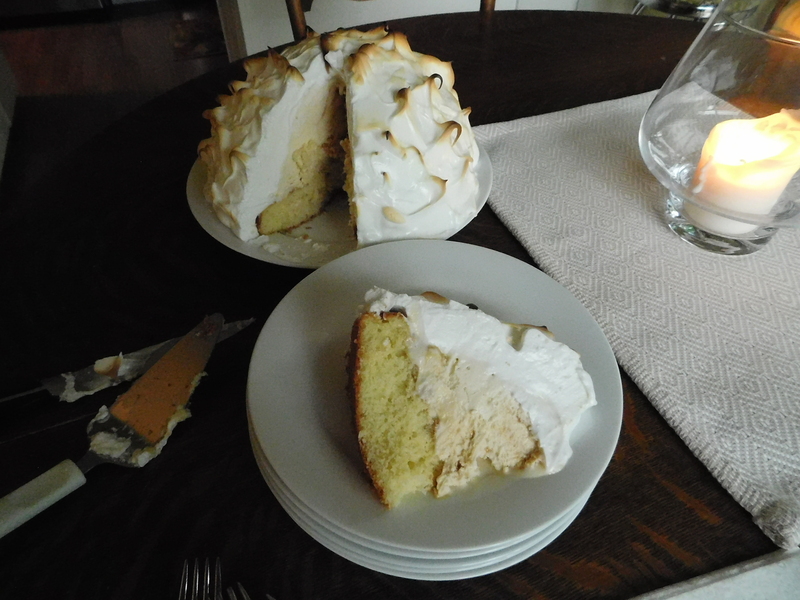 Today’s recipe for Baked Alaska is very impressive, very easy to do, and VERY delicious! There are many thoughts on where it started, but most people agree that it was first made to commemorate the new state of Alaska. I first tried this in high school, and couldn’t believe how easy and fun it was to do. 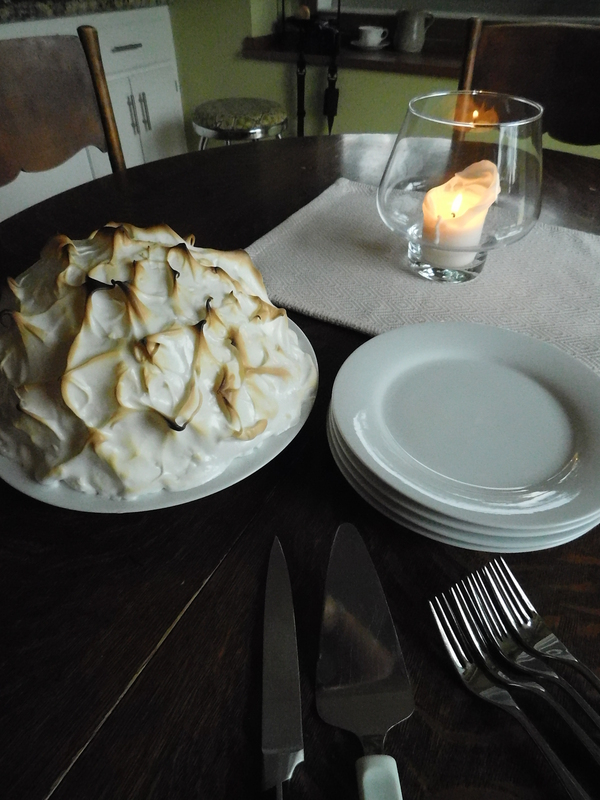 I had a group of friends who didn’t go to prom our senior year – I had them all over for dinner and made them a roast chicken with Baked Alaska for dessert instead. Who knew that this little 3-year-old would grow up and teach herself things like how to make this fantastic dessert?!! 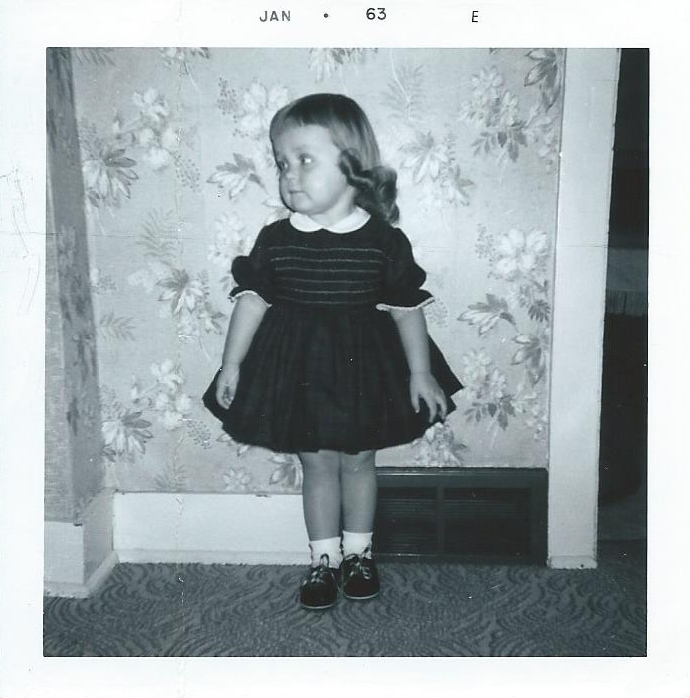 I love my little shoes in this picture – always with the white anklets. This photo was taken at Grandma and Grandpa’s farm, and until looking closer at it, I never knew that they had such beautiful wallpaper back then! Love it! It’s hard to believe, but this incredibly impressive dessert is so incredibly easy to do. You can even make most of it ahead of time, even though it is a dessert that needs to be made at the last minute. Let’s get started and you’ll see. I know you’re going to want to try this! Use a cake mix and bake using layer cake pans (you can also use a layer cake sized brownie for the bottom layer, or bake your cake layers from scratch). Cool the cake so it’s ready to go, or you can freeze the cake layers for later use. 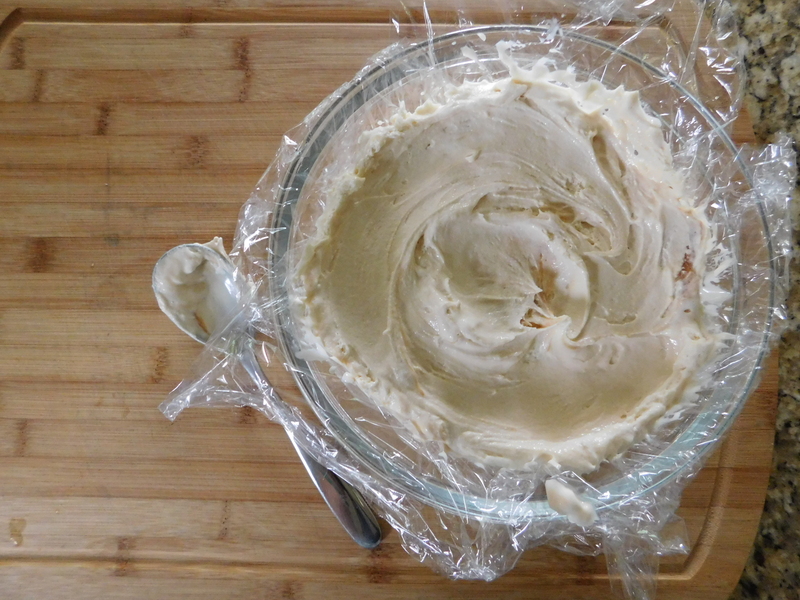 Find a bowl about the size of your cake layer and line it with plastic wrap. Soften ice cream for 10 minutes or so and spoon the softened ice cream into the bowl lined with plastic wrap and smooth the top so it’s level (I used a regular (half gallon) sized container of ice cream – you can use more if you want to, but then add a couple of egg whites so you have enough to cover the whole thing). Cover the top of the bowl with plastic wrap. Put it back into the freezer. Thaw the cake layer (if frozen) or just put the cake layer onto an oven safe plate. Put bowl of hardened ice cream upside down on top of cake layer, putting a warm cloth on top of bowl if necessary to unmold. Pull plastic wrap off of top of ice cream. Now frost the top of ice cream AND cake with the meringue, making sure to cover everything and touch the meringue to the plate so that all the cake is covered (that’s how it stays insulated and the ice cream doesn’t melt). Use your spatula to make peaks all over the “igloo”. Put plate in oven for 3-5 minutes, watching closely so the peaks don’t get too dark. Serve immediately, or let sit 10 minutes so the ice cream can soften slightly. Here is the ice cream all ready to go back into the freezer. 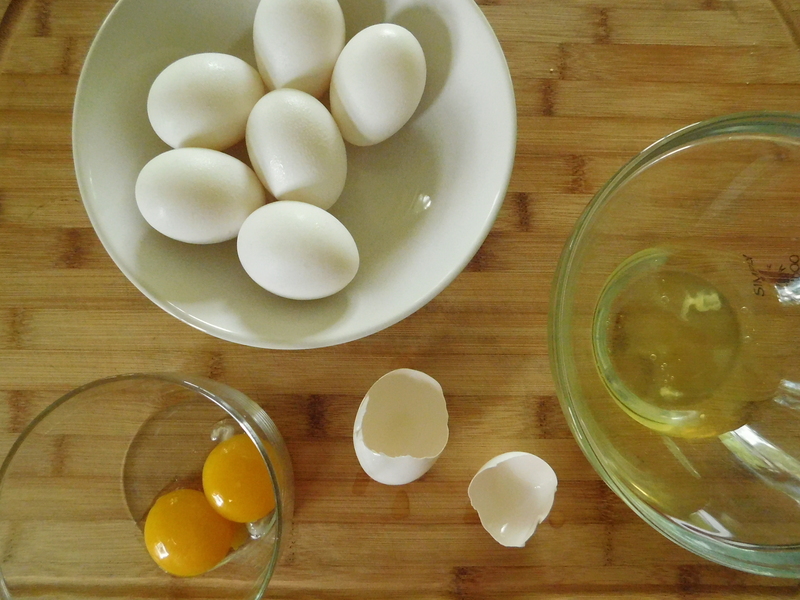 It’s a good idea to have your egg whites at room temperature before whipping – they get fluffier. When it’s time to assemble, put the cake onto an oven proof plate. Next – on goes the ice cream dome. 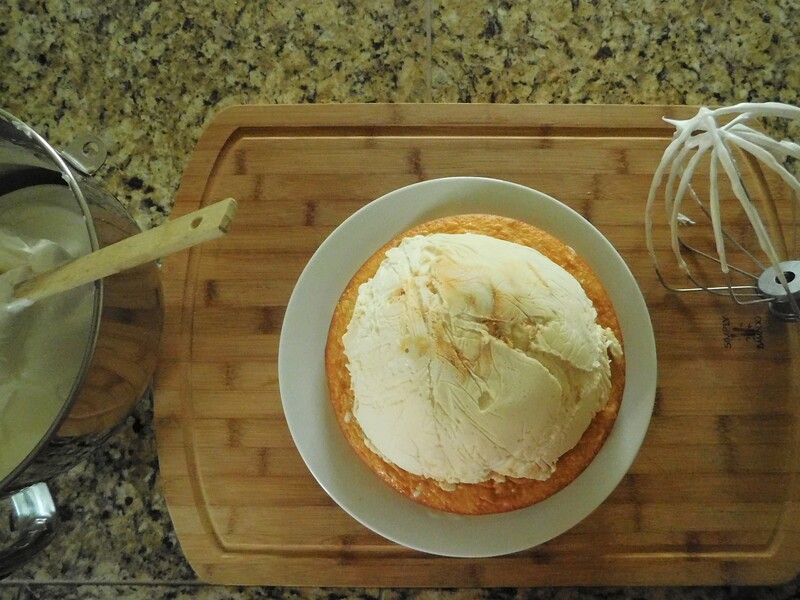 Peel off the plastic wrap and don’t forget to center the ice cream on the cake. It doesn’t matter what the ice cream looks like because it’s going to be covered in the beautiful, billowy meringue. Now it’s time to put on the meringue. Make sure you make pretty peaks all over the “igloo” before putting it into the oven. Oh. My. Goodness. My family felt like it was a special occasion – and it wasn’t – just a Sunday night dinner (special enough for us parents!). Just look how beautiful it is! I wish I would have warmed the knife in a glass of warm water before cutting so it would have been a smoother cut, but really, who cares? This IS a special cake for a special occasion. Just don’t tell anyone how easy it is to do! The cake is the perfect platform for the cold ice cream topped with the amazing, creamy, warm meringue. While this dessert incorporated white cake with caramel swirl ice cream, the possibilities are endless for the cake/ice cream combinations to try: chocolate cake with mint chocolate chip ice cream, white cake with strawberry ice cream, white cake with strawberry, chocolate, and vanilla ice cream, or even holiday combinations! It’s fun to see the different layers. 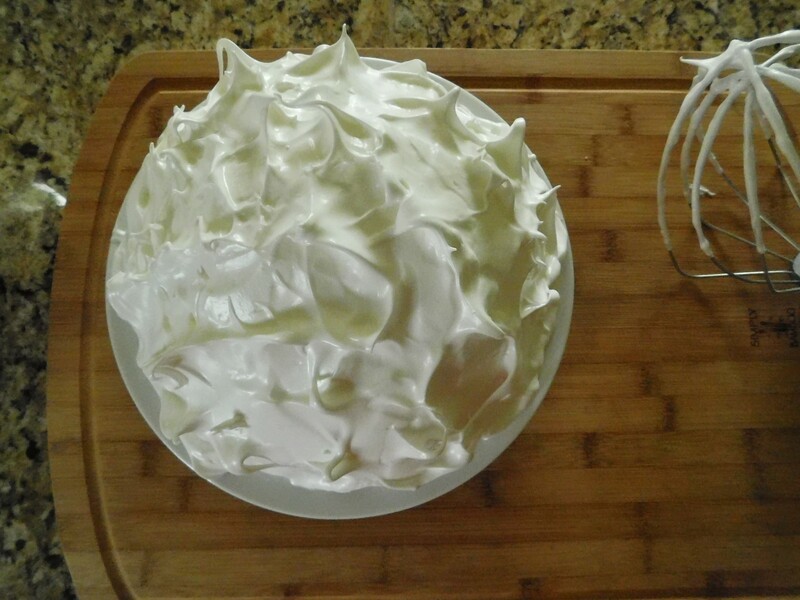 Try Baked Alaska – it’s really so easy to do, and your friends and family will be VERY impressed!